Climate policy analysis is accessible to anyone with the online C-Learn simulation. Just plug in your estimates of what kind of emissions reductions you think it will take to limit global warming to 2 degrees (or whatever your goal is) to see the effect on the rise of temperature, sea levels, or global CO2 concentration. C-Learn is a valuable tool for anyone teaching audiences and exploring the impact of different levels of climate change mitigation on our planet. Recently we updated C-Learn to make it particularly useful to the growing number of people running the World Climate Exercise, a role-playing game simulating the UN climate change negotiations. Coupled with World Climate, groups can act out what it is like to be UN climate change negotiators working to create a global climate agreement. By creating pledges and testing them in C-Learn, groups can plan how to prevent the highest costs of climate change. World Climate is played in classrooms throughout the Tyrolean school system in Austria and in many other classrooms worldwide. Materials to run World Climate are available in English, French, German, and Chinese. These latest updates to C-Learn make the integration of C-Learn and World Climate even easier by offering the same inputs as the proposals World Climate Delegations submit. The fossil fuel inputs now accept a stop growth year, reduction start year, and annual reduction. 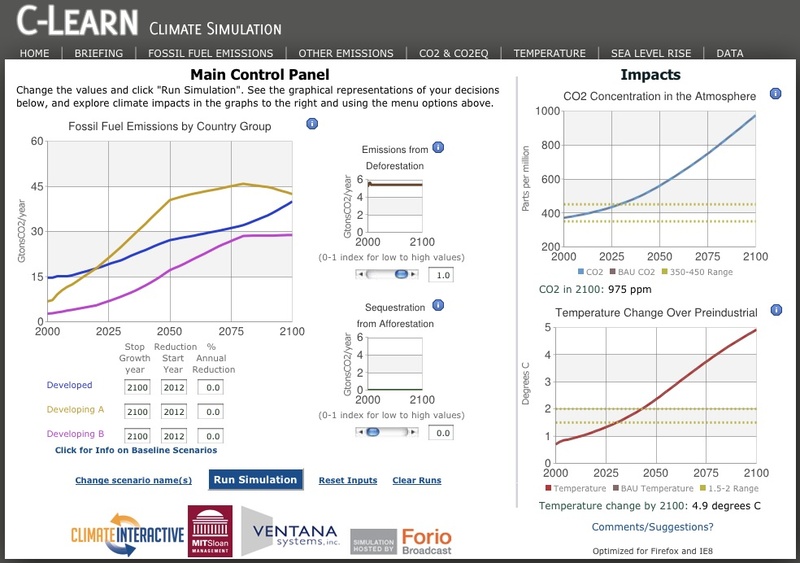 Check out C-Learn, World Climate, and our other simulations by visiting our website!